Thanks for visiting Alaska Butterflies. It might be the case that many people fail to realize the excitement of Alaska butterflies. How can a state that deep freezes for a good portion of the year provide butterfly excitement for anyone? That’s a good question with an equally good answer. Many southern states, with the high butterfly species numbers do surpass the eighty or so species of Alaska butterflies. Nonetheless, a quick glance at the list of Alaska butterflies presented here shows that any butterfly enthusiast visiting Alaska has a great opportunity to add scores of new butterflies to their life lists in a very short time. 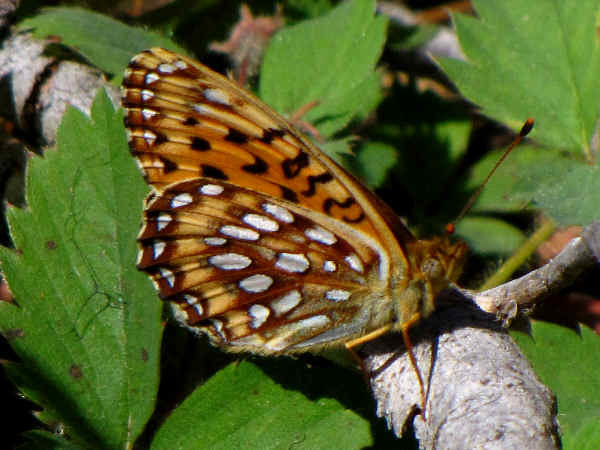 It’s especially recognizable in the Brush Foot category where about twenty different Alpine and Arctic butterfly species combine with about six Fritillary species to present a list of Brush Foot butterflies not seen in any other state. 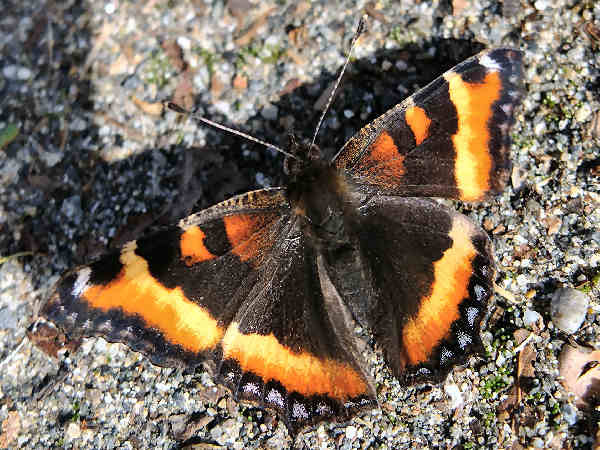 Additionally, while a good deal of Alaska biodiversity takes place in the warmer southeast corner of the state, Alaska butterflies are hardy creatures. Species can be found as far north as the Arctic National Wildlife Refuge. They also can be found at elevation up to nine thousand feet. Denali National Park, for example, boasts of fifty different species. In Fact, there’s so much to be said for all Alaska butterflies, this one page introduction can hardly do them justice. Butterfly identification usually begins with color. This Alaska butterfly section splits into categories into families, which also conveniently often are aligned with butterfly wing color. This one page introduction to Alaska butterflies lack the space to provide pictures for all the species. Please press on the green butterfly button for additional butterfly pictures and information. Pieridae is the formal name of the family that consists of the butterflies with white wings and yellow wings. 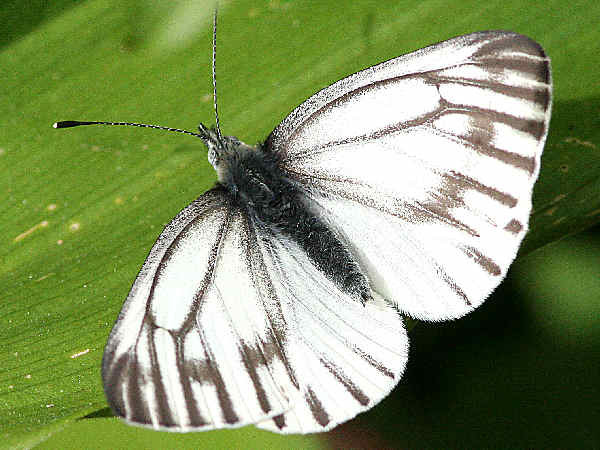 The picture at the top of the page shows a Margined White butterfly. It’s one of over a dozen species living in Alaska. Here’s the remainder of the list documented in the state. 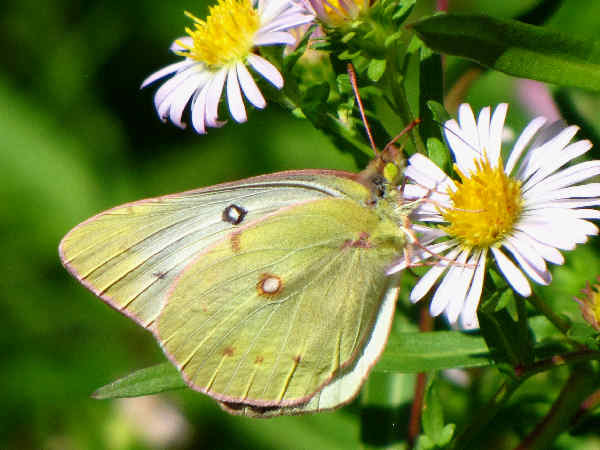 Visitors to Alaska ought to take as many pictures of yellow butterflies that they can. Seven of the eight species are bound to be a new find for them because they are not traditionally the species found in the lower forty eight states. 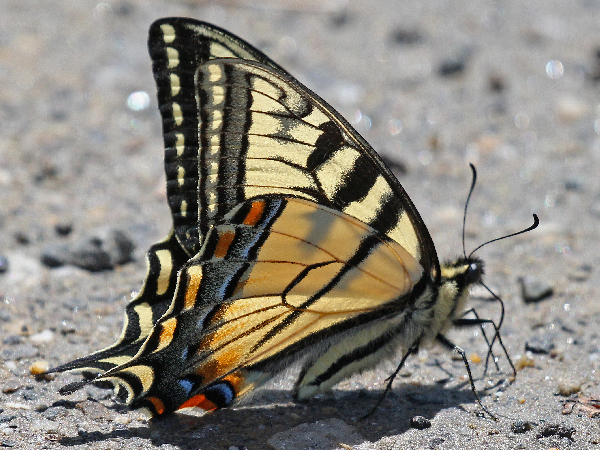 Celebrate with the Canadians in Alaska by learning about their yellow butterfly species. 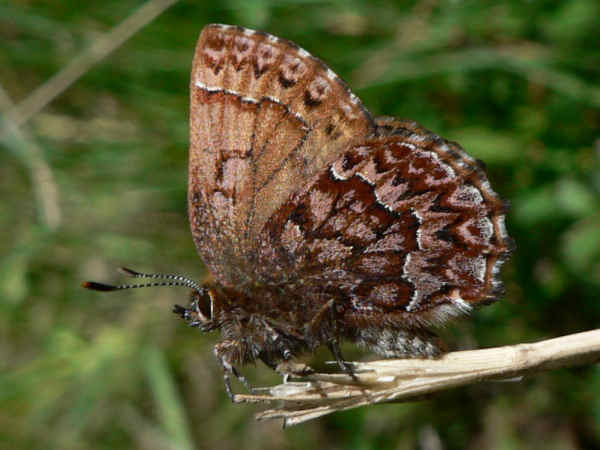 A small, but diverse group of blues, hairstreaks and coppers define Alaska butterflies. 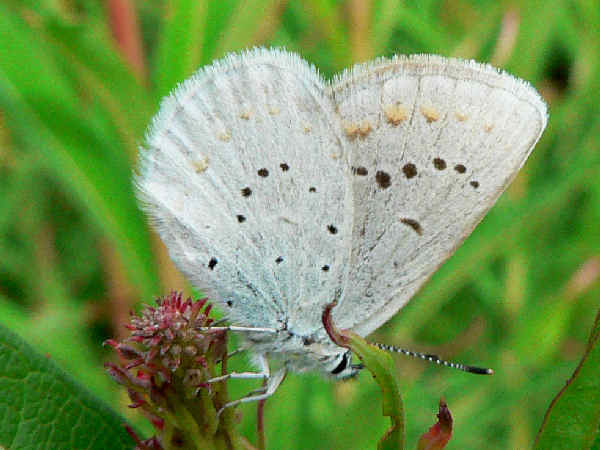 Cranberry and Arctic Blue butterflies are probably the Alaska specialties. The remainder of the species are common in much of the Northern and Western United States. The picture shows a Northern Blue. Alaska might be the only state lacking in hairstreak butterfly species. Usually they dominate the list of Gossamer Wing butterflies for every state. 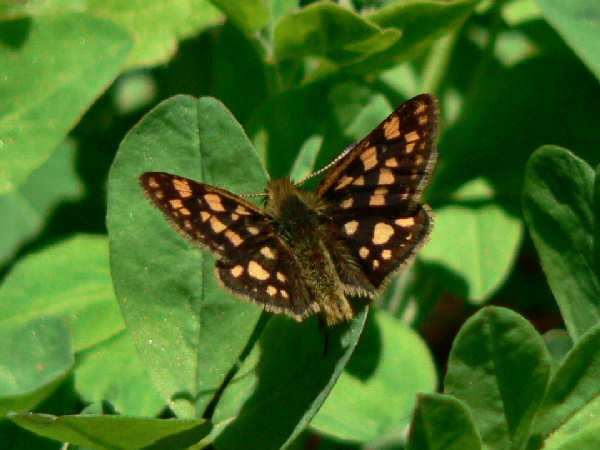 The Elfin butterflies are known for brown wings. The picture shows a Western Pine Elfin. Brush Footed butterflies are the most common butterflies in the Northern hemisphere, and Alaska butterflies for the average butterfly enthusiast means Brush footed butterflies. The most enthusiastic also know that Alaska also recently announced some great butterfly news with the discovery of a new species, the Tanana Arctic (Oeneis tanana). Milbert’s Tortoiseshell are another of the very flexible Brush Foot species. They an be found as far north as Alaska and as far south as Arizona. A few of the Alpine and Arctic species can be found along the Rocky Mountain range. They tend to be medium sized butterflies with dull colors. Parnassian are the more cold hardy of the swallowtail family species. Alaska is home to two Parnassian and two Swallowtail species. Alaska Skipper Butterflies are pretty similar to other state’s populations with the big exception being there are many less species in Alaska than other states. 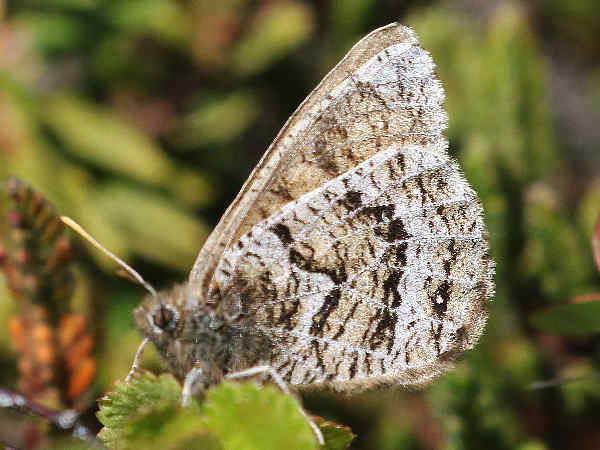 The picture shows an Arctic Skipper. They are fairly common along the northern border of the United States. They are also know as spring butterflies that bask with their wings open.